Between the ages of 14 and 26 (circa 1972 to 1984, if you must know) I read a lot of science fiction. Being quite naïve in those days, I assumed that the shared vision of the near-future common to many of those stories was the way things really would turn out. Now, several decades later, I find myself living in that future – and, for the most part, it’s not what I expected. I’m endlessly fascinated by the way SF got a few things right and a lot of things wrong – and so, it seems, is Stephen Webb. That’s what this book is all about; in his own words, its aim is ‘to compare the default future of old-time science fiction with how things are turning out’. Webb’s background is similar to my own (reading between the lines, he must have got his PhD from Manchester University a year or two after I got mine from the same place), and like me he discovered SF when its centre-of-gravity was still firmly in the written domain. In consequence, the science-fictional focus of his book is very much on novels and short stories – mainly from the period 1940-1985 – rather than on the big movie and TV franchises that younger generations might expect. Webb’s knowledge of his subject is prodigious, and in the course of 10 thematic chapters – ranging from antigravity, space travel and invisibility to robots, transportation and immortality – he discusses how those old SF visions of 21st century technology compare and contrast with reality. An occupational hazard with writing about SF is that your readers are likely to be geeks, and geeks are prone to quibble over details. Personally, I was disappointed to see so few references to some of my favourite writers – Robert Silverberg, A. E. van Vogt and John Brunner, for example – and no mention at all of Ron Goulart. Yes, Goulart was a lazy writer as far as scientific background was concerned, but that’s the whole point. Because he was lazy, he borrowed heavily from the established consensus about what the 21st century would look like – from robot servants and aircars to synthetic food and throwaway consumerism – and would have made an excellent case study for a book like this. If I have a more grown-up criticism, it’s that Webb strays too often from his really fascinating core theme. Not all the SF technologies he talks about were meant to be taken as serious predictions of the future. 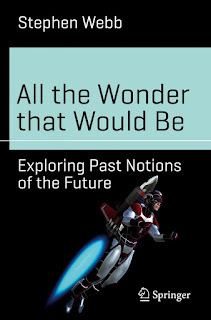 Time machines and faster-than-light spaceships, for example, are usually just convenient story-enablers, while other topics – such as antigravity, invisibility or immortality – crop up more in the context of “what if this happened?” rather than “this is likely to happen”. Personally, I was more interested in Webb’s treatment of those background technologies that the SF community genuinely believed the future held in store – such as domestic robots, moving roadways and moonbases. Nevertheless, it’s an excellent book, with two really important messages. The first is that we don’t live in the future that SF writers envisaged for us. The second is that our technology really is a big advance on theirs, but in ways they rarely touched on. An iPhone, for example, has capabilities that would have seemed unbelievably far-fetched in the 1940s, and probably even the 1970s. And while I’ve never had a vacation on the Moon, I make use of space technology – in the form of satellite TV and GPS navigation – almost every day.